Home» » AP RBSK Instructions to De-worming Day on 12/02/2018 Guidelines. AP RBSK Instructions to De-worming Day on 12/02/2018 Guidelines. Radtriya Bala Swantha Karyakramam (RBSK) Conducting De-worming Day in all School level/College Leven from Class 1st to 12th Standard College level Programme Guidelines on 12/02/2018. Radtriya Bala Swantha Karyakramam - RBSK - Guidelines for De-worming Day on 12/02/2018. Conduct press meets along with DE0s, PO (SSA) and PO (ICDS) involving print and electronic media to brief the importance of the de-worming day before and after the event. All Program Officers, Chandranna Sanchara Chikistha,108 Coordinators, RBSK-Coordinators, Municipal Health Officers, JD SW, DD (TW), DD(BCW), AD Disabled Welfare, Minorities Welfare, Dy EOs, & Sectorial Officer's of SSA MPDOs and Mandal /Special Officers( if identified). The DM&HOs are requested to meet the District Collector along with DEO, PO (SSA)after preparing Action Plan in this regard for making this program a objective oriented. Awareness activities shall be carried out from district to villages by rallies, banners posters and media briefings Wide range of awareness activities at school level by conducting drawing competitions and essay writings on sanitation and importance of deworming shall be conducted. The programme conducted involving SMC members, parents and other dignitaries. o Provide mobility budget from available RBSK funds to PHC Medical Officers. Ensure distribution of drugs as per requirement to all PHC5 and to the Anganwadi centers and schools/junior colleges. Ensure coordination between MO-PHCs and ME0s/CDPOs of the Mandel for proper distribution of the drugs and IEC material in the Mandel. Activities at Mandril to be taken up by PHC medical officers To prepare Mandal level action plan for distribution of drugs and to conduct the Deworming Day. Instruct MPDOs to supervise the Deworming program in the Mandal. 'Instruct MPDOs to coordinate/converge with all tine departments for effective implementation of the program in the Mandal. Medical officers are instructed to prepare school wise student list in coordination with CDPO, MEO/CRP & I ERTs for proper distribution of Drugs. Medical officers of the PHC/UPHC have to place indent to the RBSK Coordinators to draw the required quantity of tablets for further distribution to Anganwadi centers and schools In their jurisdiction through ANM5 and ASHAs. Budget will be provided to DM&HO for mobility of MO and his team to utilize the national de worming day of drug administration and MO is instructed t emergency drugs and IV fluids with him/her. MOs have to supervise the program and also to attend any emergency. MOs are instructed to inform to Chandranna Sanchara Chikistha and 108 coordinators regarding this program and to take their support. One the day of the de-worming, Principals, Teachers and Anganwadi workers should be prepared for any Adverse Event or Severe Adverse event by having read through the Adverse Event Protocol/ Guidelines in advance, and ensure that protocol and emergency numbers are on hand. All the teachers and AVVVVs should clearly understand that children who are sick on the day of De-worming should not be given the De-worming tablet. Teachers and Anganwadi workers MUST administer Albendazole tablet under their direct supervision in schools and Anganwadi on De-worming and Mop up Day. Events such as nausea. Mild abdominal pain, vomiting, diarrhea and fatigue may occur among children especially those with high warm infestations. These side effects are transient and do not require hospitalization. What should the teacher / Principal /AVVVVs DO when mild adverse event at school or Anganwadi centers happens? Children with ANY side effects should be taken to an open shady place and allowed to lie down and rest. They should be provided with clean drinking water. A Severe Adverse Events (SAE) is fatal, life - threatening, disabling, or incapacitating or that results in ho-spitalization after drug intake. Choking hazard/asphyxia is caused a severe adverse event which needs to be responded to immediately. o Separate the affected child from other children and stop de-worming activities. Stay calm and communicate Severe Adverse Events is likely not due to the deworming drug. School Principal should immediately call the help line number as per shared details by PHC medical officer. If Ambulance services are available, immediate alert to the Ambulance should be given for the transport of the child nearest Government Hospital. The ANM should inform the Medical Officer who should complete an incident report form (Annexure 4) and submit it to Civil Surgeon the same day. The designated Officer will sign / confirm the reports, and determine if further investigation is needed and submit the report to the Commissioner Health and Family Welfare immediately. The Commissioner health and family welfare or the designated Officer will be the spokes person. Management of SAE after De - Worming Day Teachers, AVVVVs, Parents, health facilities and all health officials and providers, including ANMs must be vigilant for such incidents in the area and elevate immediately to the information cascade. Parents Should be informed that though mild AEs are expected and severe events are likely to be unrelated to the drugs.. they are encouraged to report the incident at the earliest to ANM ASHA or school principal if they are very worried about the health of their child. 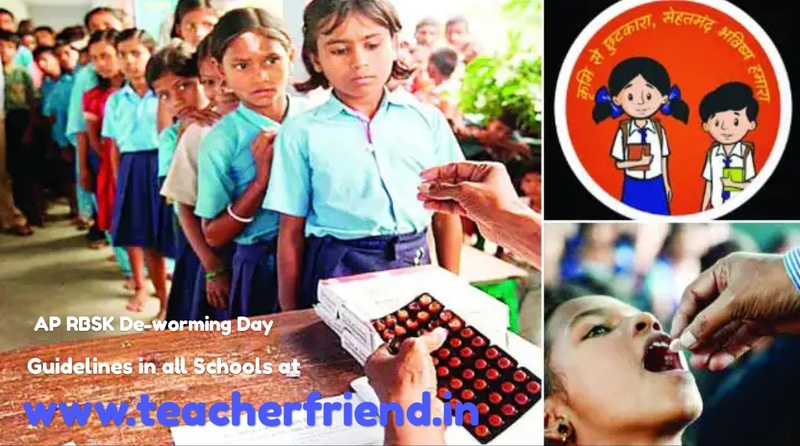 Should investigate absenteeism more carefully after deworming day and encourage any sick children to seek treaffilent or inform an ANM if they are worried. ANMs To report any case brought into notice to the District Civil Surgeon or Chief Medical Officer through Block Medical Officer or directly as feasible. 'ts for school and Anganwadi to avoid. Keep telephone numbers for helpline and the nearest health center and / or providers such as ANM and MOIC handy. Always direct the children to CHEW the medicine to avoid choking. Administer the tablet under your direct supervision. For younger children at anganwadi. crush the table first and then administer. Do not administer medicine to a sick child. Do not instruct children to swallow the medicine without chewing first. Anganwadi Teachers will record number of enrolled children dewormed in the school. Anganwadi workers will record number of registered. unregistered & out of going school children dewormed in AWC's. the name of dewormed student in the attendance register. attendance register. separately for both DD & MUD and will report to the nodal teacher / principalat school.